Zoom's TAC-2 concept remains the most cost-effective way to record audio via Thunderbolt. 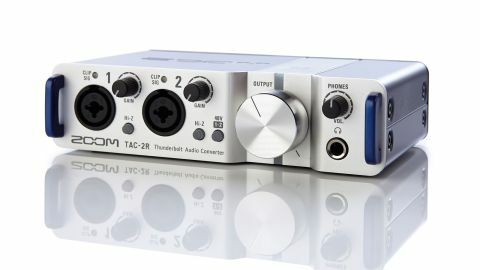 The TAC-2 interfaces offer Thunderbolt recording at a breakthrough price. Rack-mounted design offers a more 'one dial per function' approach. MixEfx software expands TAC-2R's feature set and is well designed. Not ideal if you need multiple ins/outs or super high quality mic pres. Zoom's original TAC-2 desktop interface turned a few heads when it arrived last year, not least because it offered Thunderbolt audio interfacing for a fraction of the price of the competition. The unit now returns in rack-mounted form, which not only provides the option to move the interface from the desktop to a rack space, but also expands upon elements of the original TAC-2 design. In case you missed news of Zoom's first TAC-2 interface, here's an overview of its capabilities, which are matched almost entirely by the TAC-2R. The unit provides a buss-powered Thunderbolt connector for lightning fast recording and playback speeds at sample rates up to 192kHz and 24-bit resolution. It offers two-in, two-out processing, with the combi input ports accepting Microphone, Instrument and Hi-Z sources, whilst a headphone port complements the main stereo outputs. "It's no frills - Zoom is keen to get you plugged in and recording as quickly as possible"
The TAC-2R offers a similar line-up of features but, rather than the slender desktop wedge of the TAC-2, it is housed in a half-rack sized unit. The front panel provides the combi input ports, complete with independent Gain rotaries, whilst buttons below each port allow you to toggle Hi-Z functionality on and off, as required. There is also a Phantom Power button to provide 48V for both inputs, with Clip Sig(nal) LEDs to show when you've cranked Gain above optimum settings. Output monitoring volume is controlled from the most prominent dial on the interface - a large, silver rotary which features a lightly-grooved surrounding edge which adds nicely to its tactility. A blue light glows reassuringly above it when the unit is powered up, which is achieved via the Thunderbolt buss itself. To the right is the headphone port with its own volume control, whilst the rear panel provides 1/4-inch stereo output ports, MIDI In and Out, plus the Thunderbolt connection port. A Direct Monitor toggle allows for monitoring in Mono or Stereo without latency. Beyond the design differences of the TAC-2 and its R brother, there are some key operational ones too. Whilst the TAC-2 favours setting up inputs by clicking the prominent rotary to toggle from one input to another (as is popular with a number of similarly-shaped interfaces), the TAC-2R has more of a 'one dial per function' approach which lends it a slightly more 'pro' air. Compared to some of its more expensive competition, however, the interface remains a little plastic and lightweight in construction terms, whilst the preamps onboard don't offer the celebrated sound quality of those from Focusrite or Universal Audio, for instance. So, whilst this is a 'what you see is what you get' interface, it does offer some extras if you download the TAC-2 MixEfx software from Zoom's website. This provides a pleasing front-end to the interface, providing visual feedback of input configuration settings and even expanding the feature set with Low Cut Filters on each channel, phase reverse options and monitoring effects, which can be added during recording. Zoom stole a march on affordable Thunderbolt audio interfacing with the release of the TAC-2 last year and it has doubled its presence now with the TAC-2R which, offered at exactly the same retail price as its brother, provides you with a second low-cost option if you're attracted by Zoom's approach. It's no frills - Zoom is keen to get you plugged in and recording as quickly as possible, so this isn't the interface to turn to if you need multiple ins and outs or higher-quality mic pres. However, that's not to suggest that the TAC-2 offers sub-standard audio quality, so if you're determined that your interfacing needs require Thunderbolt, this unit certainly reinforces the view that Zoom is the way to turn if you're looking for good quality at a market-leading price.